The Marshall Islands include the Ratak (“sunrise”) and Ralik (“sunset”), two parallel chains of 29 coral atolls with thousands of tiny islets and hundreds of very small low-lying islands. Because of its very low elevation, the Marshall Islands are threatened by the potential effects of sea level rise. The nation is the most endangered in the world because of flooding that some scientists link to climate change. No Seventh-day Adventists lived on Ebeye [pronounced: EE-by] Island when the Adventist Church signed a U.S. government contract to oversee its sole hospital in 1980. At the time, Ebeye, a speck of land with 12,000 people in the Pacific Ocean, was part of the U.S. territory of Micronesia, and I worked at the hospital as a nurse. My husband, Rellong, was Ebeye’s police chief, and we wielded some clout on the island as a main tribal landowner. The Adventist Church, which ran the hospital for four years, brought in a team of top administrators, doctors, and nurses. The new head nurse, Jerry Whitland, invited my husband and me to take Bible studies. We agreed, and he started coming to our home every evening. Around that time, my cousin Tommy Kilma, an Adventist pastor, and two church leaders from Guam arrived on the island and asked my husband for permission to open an Adventist church and school. My husband spoke with other tribal leaders and received their consent to turn one of his buildings into a school. The building was a dance hall and bingo parlor, and my husband and I felt increasingly uncomfortable with that business as we studied the Bible at home. A kindergarten and elementary school opened in the building in fall 1980, and my eldest son, R.D., became one of the first kindergarten students. We studied the Bible in our home for three years. Sometimes, the head nurse gave the study, and other times it was led by the hospital administrator or another Adventist connected with the hospital. I faced a struggle. I was raised in a strict Sunday-keeping home, and my father, a church deacon, led the congregation on my native island of Namu whenever the pastor was away. But my husband and I saw that we were being taught the truth from the Bible, and we were baptized in 1983. We were the first Adventists on Ebeye. After that, my father never said another word about my keeping the Sabbath on Saturday. He understood that I had found the Lord of the Sabbath. The Marshall Islands, where Ebeye is located, gained independence in 1986, and the next year we moved the school to a larger building, a former warehouse owned by our family. At the new location, the school expanded its curriculum to cover pre-kindergarten through twelfth grade. My son R.D. completed all 12 grades at the school. People have noticed that I am always smiling, and they ask why. I have had some trials, but whenever there is a roadblock, God opens a way. In 1987, my husband had to be airlifted to Hawaii for emergency treatment for an abscess on his lungs. The doctors weren’t sure that he would make it. We prayed, and my husband walked out of the hospital in just five days! He was in perfect health. I am thankful to God that his life was spared. He died in 2017 at the age of 67. A few years after my husband’s health scare, we faced another medical crisis. A baby boy was born to my younger brother, an Adventist church elder on Ebeye. The boy’s head grew larger and larger, and we rushed him to the hospital. The doctor announced that he had fluid in his head and had to be airlifted to Hawaii. When the plane landed in Honolulu at 3 a.m., I said, “Before we go to the hospital, let’s pray.” We prayed in the plane. We prayed again while waiting to see the doctor at the hospital. When the doctor examined the boy, he couldn’t find any fluid. The boy’s head had shrunk back to its normal size. He had been healed! I believe in the power of prayer. I smile because of God. I give everything to Him, and I believe that He will provide everything. 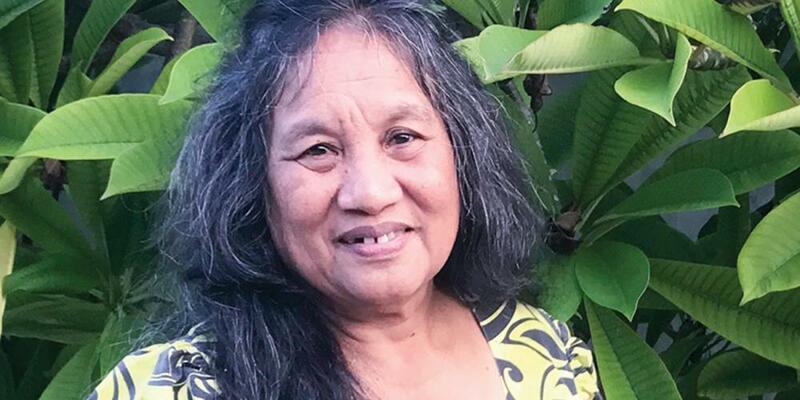 Nojab Lemari, 66, retired from the hospital as the chief nurse and remains a major supporter of the Adventist Church on Ebeye Island. Part of this quarter’s Thirteenth Sabbath Offering will pay for urgent repairs to the aging school building that Nojab and her husband gave in 1987.